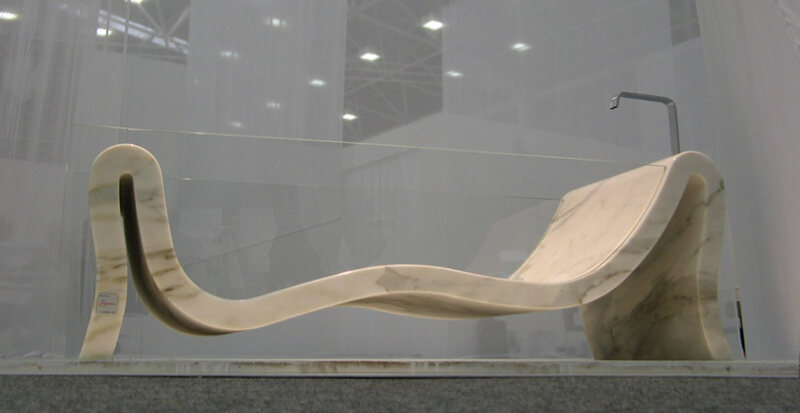 Milan Furniture Fair is one of the most important events in the world for furnishing and furnishing accessories. Milano Design Week also includes another event called Fuorisalone which takes place in the heart of Brera Design District in the historic centre of Milan. 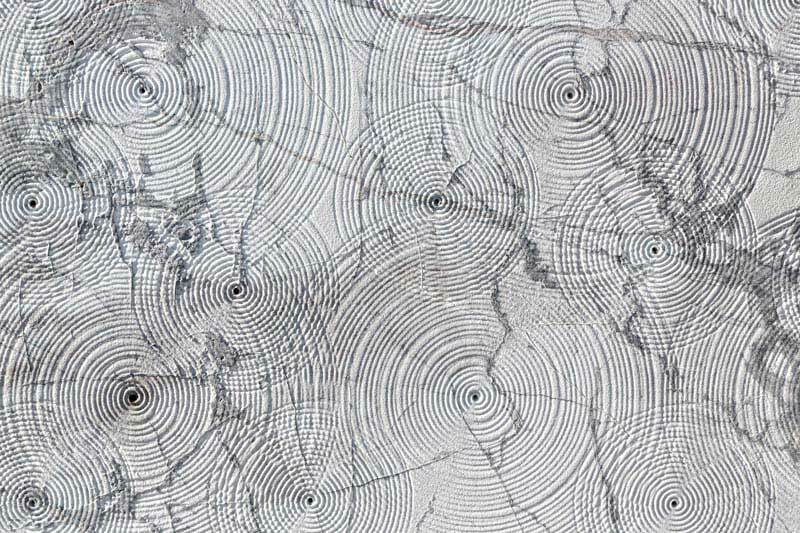 Fuorisalone is the best appointment concerning the design furniture to which Dedalo Stone - after the recent victory of the Best Communicator Award in the Design category at Marmomac Fair 2018 - will participate from 8th to 14th April 2019 with the newest marble furniture installations. 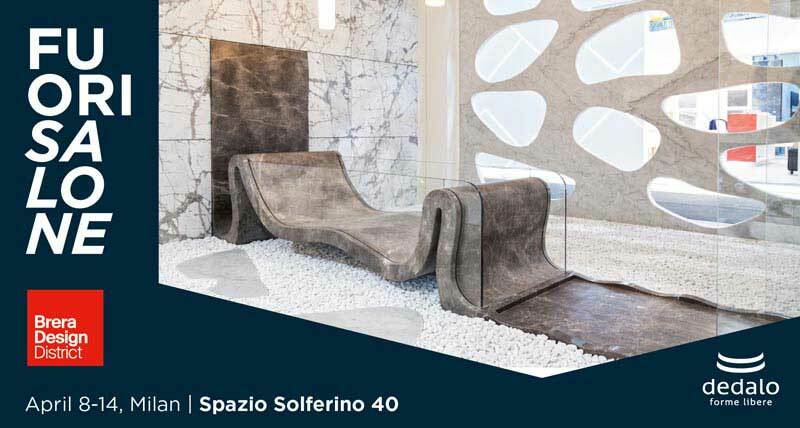 Inside Spazio Solferino 40, Dedalo Stone will exhibit one of its SPA systems in elegant gray marble and extra-clear glass, composed of the sinuous Hydra bathtub and of the shower tray integrated into the wall covering. Sinuous shapes that gently accompany the eye of the beholder from the curves of the tub to the shower tray, up to the wall, all integrated in a system that divides the space of the room into two parts. 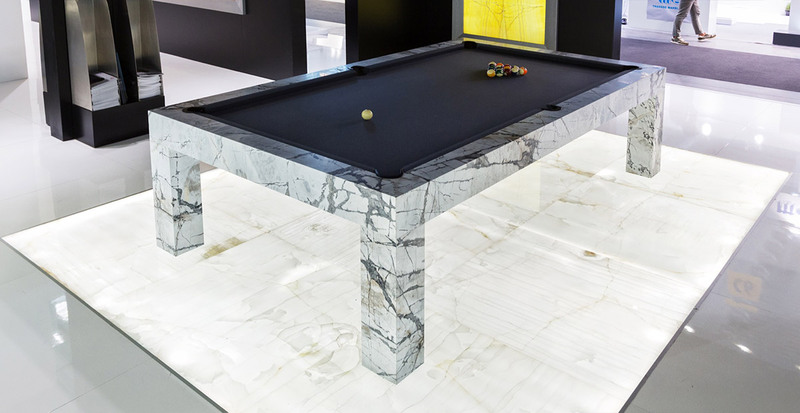 Another design experiment developed by Dedalo Stone which will be also present at this exhibition is Quadra, our latest model of marble pool table. Made of Iceberg Blue Marble, it stood out at Verona’s MarmoMac Fair 2018 for having wisely combined the sculptural and extemporaneous appearance of marble with a more playful dimension. On display at Fuorisalone there will also be a selection of new three-dimensional finishes designed to be applied to materials used in flooring and coverings even with anti-slip function and therefore ideal for bathrooms and spas. With the insertion of light points just beneath the surface, the shapes are exalted through captivating chiaroscuro effects. All three-dimensional finishes are designed and created by designer Davide Devoti. The location of Dedalo Stone exhibition during Milano Design Week. Dedalo Stone space is located in Via Solferino, 40, from 8th to 14th April, at Spazio Solferino 40, within the Brera Design District. Dedalo Stone is included in the event “DeConstructed Home Italy design show” organized by Home Italia. The event brings forward the concepts of an essential geometry that plays with pure elements, destabilizing the balance of the formal structure. Fragments of volumes alternate by recreating a space where different design expressions coexist in the definition of an abstract domestic space. A tribute to Deconstructivism, not meant as an artistic movement, but as a liberating push, where the absurd becomes form and the emotion penetrates into architecture. Home Italia is conceived by Maurizio Lai as the exclusive club of furniture lovers, an unusual container which pays homage to originality as a swerve to conventional aesthetic standards. The showroom is open from 10am to 9pm.